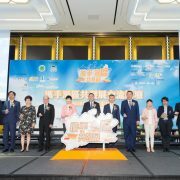 The Secretary for Economy and Finance, Mr Leong Vai Tac, attends the opening ceremony of a seminar on the Guangdong-Hong Kong-Macao Greater Bay Area, held by the Industry and Commerce Association of Macau. Next: Officials of the Land, Public Works and Transport Bureau open tender documents for decoration works of the Industrial and Commercial Development Fund office located at 1A to 1C in Rua de S. Domingos. The Chief Executive, Mr Chui Sai On, attends a plenary session at the Legislative Assembly to answer questions raised by Assembly members concerning Government policy and social issues.